What an amazing way to spend Heritage Day! Mary Frost did a fantastic job once again of pulling the entire day together despite a number of challenges. We parked at Rondebosch library and left our cars in the care of John from Erin Hall. Packed into a 28 seater bus with spill-over participants in a car, our first stop was the Slave Church in Long Street with its bittersweet history and its beautiful wooden features. Such a pity the Church is no longer in use as a church except when it is hired out for special occasions such as weddings. The Unitarian Church was next, just around the corner. 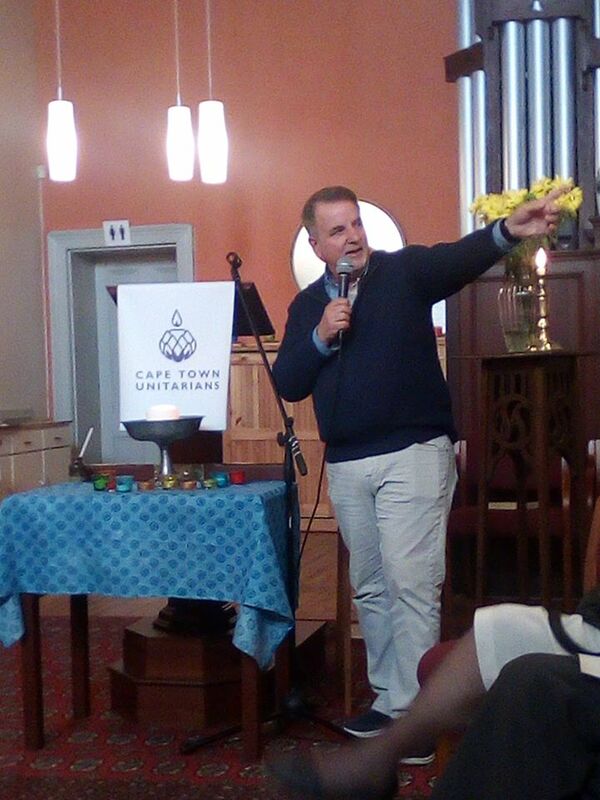 Minister Dave Clements introduced us to this vibrant and historic church with its history of deep community care. From there we went up to Tanu Baru, the Muslim Cemetary (the first recognised as such) in the Bo-Kaap and the resting place of many of the pioneers of Islam in the Western Cape. Moegamat Kamadien was an entertaining and informative guide as he wove the history of the Cape into the description of how the Cape Islamic community came to be a unique people, and why it is so important that gentrification of the Bo-Kaap is recognised for the threat it is to the community that has called it home for generations. And then we were off, our extremely skilled bus driver easing that bus over the cobbles and around the impossibly narrow corners of the Bo-Kaap, across the city to the Muir Street Mosque (Zeenatul Islam Masjid), where Sheikh Moerat and his wife were waiting to welcome us. 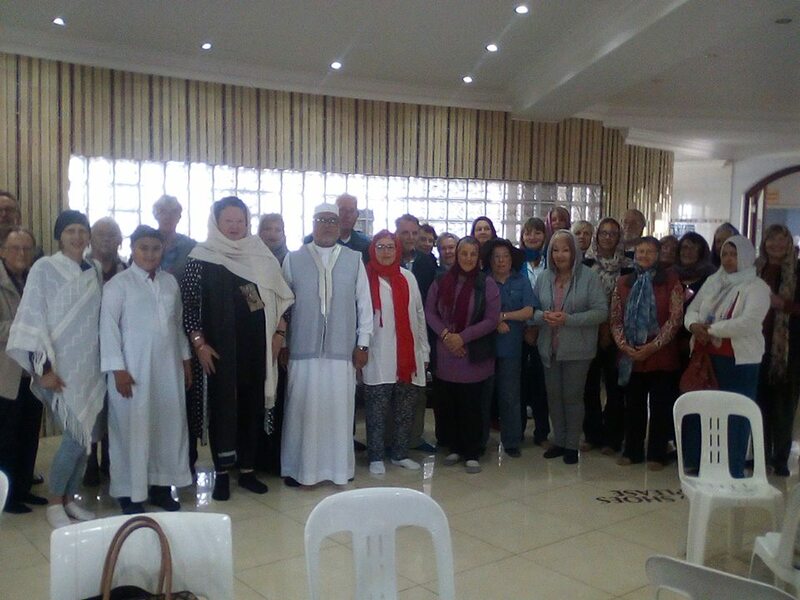 What a warm welcome that was – Sheikh Moerat and his wife blessed our visit by gifting us with a tasty, hot vegetarian lunch (photo: below left). We were invited to stay for the noon prayers, and felt deeply honoured to sit at the back of the Mosque quietly honouring the prayers of those who flocked to the Mosque to pray at that time. 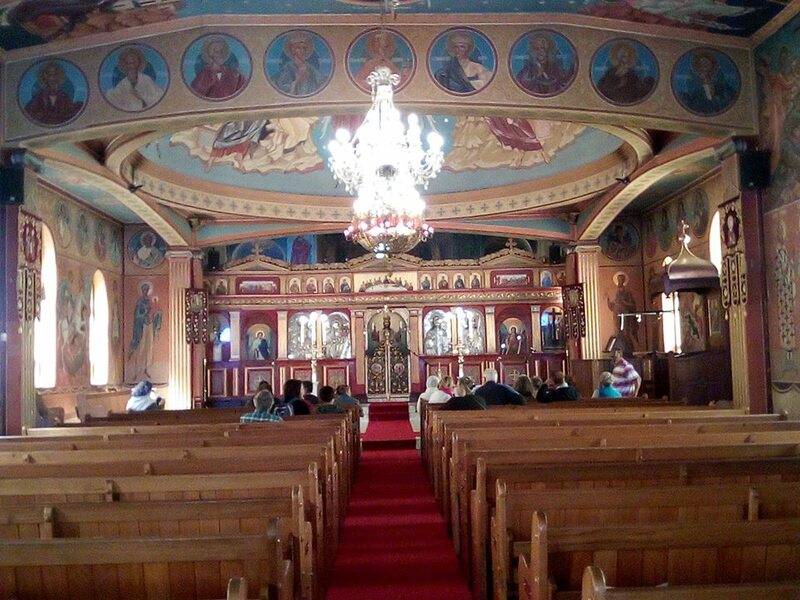 Our final destination was the Greek Orthodox Church in Woodstock (Photo: above right). 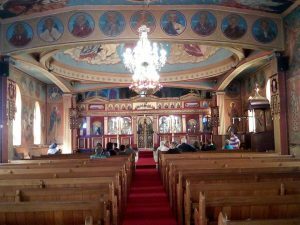 The caretaker kindly let us in and did his best to answer our questions about the symbology of the detailed paintings and ornate decorations that characterize this breathtaking Church. Thank you Mary Frost, what a splendid and expansive experience which was enjoyed by all. Next year we plan to fill the 60 seater bus!